‘What we need’, I said to Nita last weekend ‘is a nice easy short walk to get us back into it after three weeks of coughing, spluttering and very little exercise’. Well that was the plan anyway, but as so often happens, things didn’t exactly turn out this way. 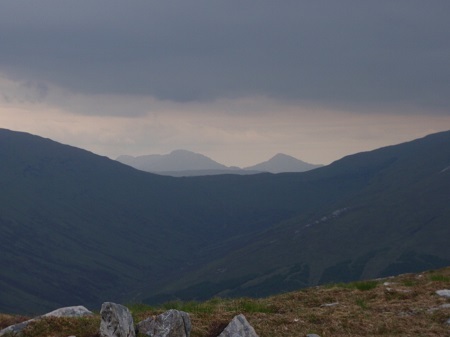 We had decided that the place to go was Beinn Inverveigh; a long whale back of a hill that rises close to Loch Tulla. 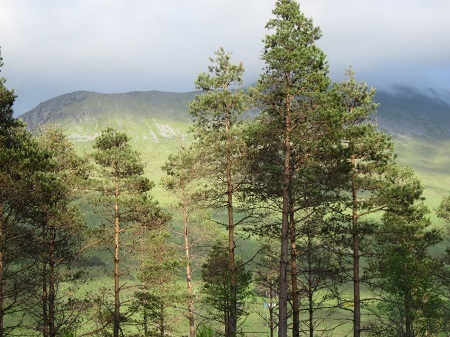 To give ourselves a gentle walk in, we parked the car at Bridge of Orchy and followed the West Highland Way a couple of kilometres to a high point overlooking Loch Tulla. It was so good to get out again and even though the clouds were thick, dark and quite low, there was a wonderfully atmospheric feel to the day …..and it wasn’t raining. A couple who had been following us along the WHW passed at this point and continued along the path as it descends towards the Inveroran Hotel …..and they were the only people we saw during the whole of the day…….not bad for mid June. 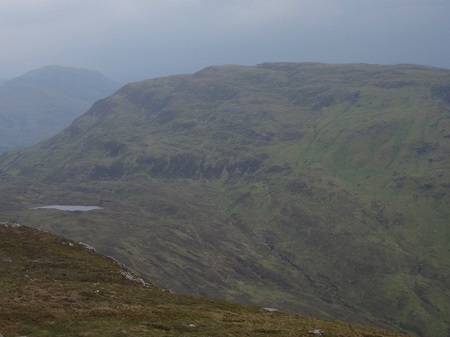 Our route left the WHW and followed a small path heading towards Beinn Inverveigh. The cloud appeared to be rising slowly and it was certainly above the top of our modest little hill and as we started heading up steeper ground to gain the end of this long broad ridge, the sun actually came out for a brief spell. Once the height is gained, it’s an easy wander, the ground being a mixture of grass, moss and rock. Normally there are many wee lochs and pools up here, but the dry spring had meant that many of the smaller ones were dry, the dark peat cracked into crazy patterns. 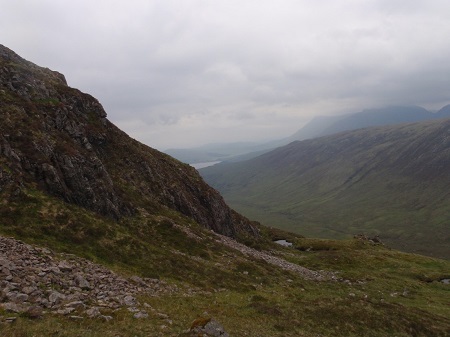 The top of Beinn Inverveigh is one of these rocky outcrops that just happens to be a few centimetres higher than all the rest …and is marked with a small cairn. Another little outcrop about 100 metres away also has a cairn, but which one is the highest is a debatable point ….which ever one you stand by, the other always looks higher …until you go to that one and look back! And that, as they say, was supposed to be that. We’d taken about three hours to do this leisurely walk and had planned to have an even more leisurely lunch break and then wander back ….an ideal little airing. Well……despite, in all honesty, feeling a little weary, I started to look over my shoulder to where I could see the dark lump of the neighbouring hill, Meall Teibh…..and it did look very inviting. I think in some respects, I’m a bit like a gold fish for within a few minutes of sitting down, I’d completely forgotten that my legs had been aching and that I was feeling tired and had planned a nice short easy walk. I heard myself saying to Nita, ‘we’ve never walked Meall Teibh from this direction …what do you think?’ Nita, realising her short day was going out the window, is, none the less, equally mad and she agreed that it would be a waste of the day not to head on over to the second hill. Our short day had just turned into a considerably longer one. Getting over to Meall Teibh involved continuing along our present ridge for a further kilometre or so before a steep descent to a broad lonely bealach between the two hills. A beautiful little loch lies here below the steep sides of the two hills and other than the shrill calls of some birds on the loch and an occasional buzz of an insect; it was completely quiet and incredibly peaceful. The steep haul up on to Meall Teibh reminded me why I’d planned a short easy day ….my legs complained something rotten, but before long we were sat by another pile of rocks marking the second little summit of the day ….two hours from top to top. 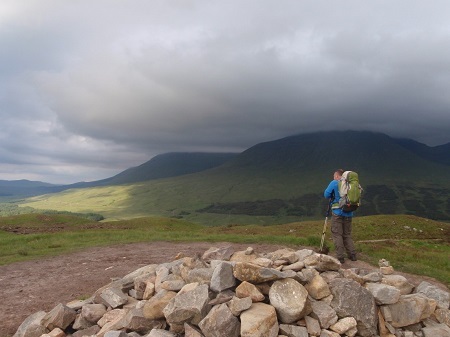 We now had a lengthy walk back, first along the length of Meall Teibh to reach the small road by the Inveroran Hotel, and then back by way of the West Highland Way to Bridge of Orchy. It was a lovely walk back though especially as by this time the dark cloud was breaking somewhat and there were patches of bright evening sunlight to enjoy. We got back to the car about 19.45 …..we’d planned to be back in Irvine eating an evening meal by then ….but what the heck; we’d had a wonderful long short walk.